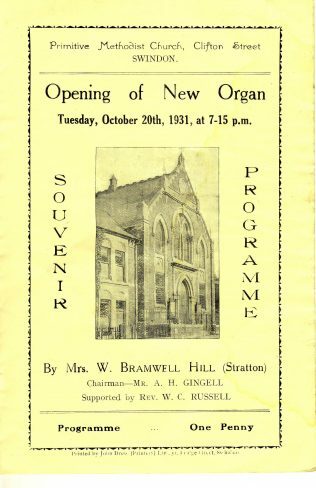 In 1931, Mrs W. Bramwell Hill (Norah Barnes before her marriage) carried out the formal opening of the new organ at Clifton Street PM Church in Swindon. There was a full programme of entertainment, followed by a Coffee Supper, costing 1/- for adults and 8d for children. The programme includes a full listing of all choir members and others taking part. The organist is named as Mr L H J Fisher, with Miss Ivy Ayres and Miss Eva Lewis as his deputies. This clearly made the Prims at nearby Lower Stratton, a village just outside Swindon, think – or was it rivalry? They used an American organ to lead the singing and decided, at the suggestion of a Mr Cook, to celebrate the opening of the first chapel in the village in 1830 by a centenary appeal to buy a pipe organ. 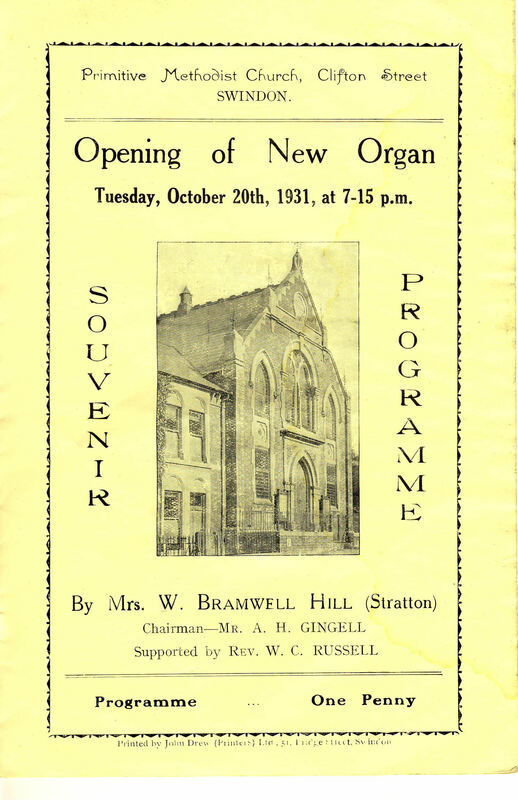 The same W Bramwell-Hill (by now with a hyphen in his name) was the organ appeal fund secretary. I don’t know whether to believe it or not, but a note I have about the organ appeal says that the previous American organ was sold “for jungle research”. Make of that what you will. 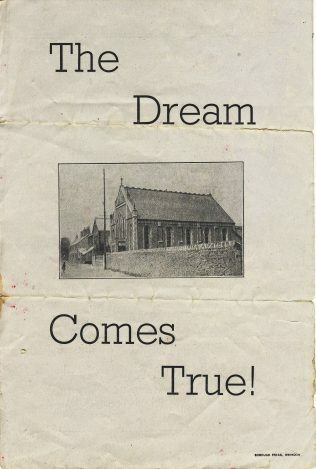 Mind you it took them until 1938 before the organ was installed and opened by Mrs Levi Cook, the oldest member who had worshipped in the former chapel and had started the organ appeal with a £1 donation. Even then the appeal had not been as successful as it might have been. They were still having collections for the organ fund at the opening ceremony. The Stratton organ was built by Martin and Coate of Oxford and it wasn’t until the early 1960s that the organ was completed to its full initial specification by the original builder, by then into his 90s. The opening recital was given by Mr Lionel Morse. The regular organist (until the late 1950s) was Mrs W G Miller, well known for her habit of always using the trumpet stop for the third verse of every hymn, regardless of the words. In neither Clifton Street or Lower Stratton are there any details of the actual organs. Perhaps that is not the interesting bit. Pneumatic action (exhaust charge, I think). Berkeley continues: “I cannot remember the exact year that the ‘prepared for’ stops were installed, but I acted as a driver for the ancient Mr Coates of Oxford and his grandson assistant (who did not have a licence). I drove to their works in Oxford, collected their van, drove to collect pipes etc from makers or sellers (the pipes used for the completion were second hand), delivered them to Stratton, took the van back to Oxford and then collected my car and drove home. I had not long passed my driving text and was a student at Sutton Bonington at the time. It must have been the summer of 1963. Bramwell (William Charles Bramwell Hill, PM preacher) was responsible for getting together the money for the completion. The ‘prepared for’ stops had been initially blanked off on the stop jambs with a black cone and central button. The missing stop knobs were found in a box inside the organ, left from thirty years before. I am sure I played at the reopening recital, which included Boelmann’s Gothic Suite. The Orpheus Choir also took part. I think I have a copy of the programme somewhere. I vividly remember the Dulciana pipes being installed at 5pm on the day of the concert, and not properly painted until later. The action was never very prompt, and had an unfortunate habit of fluttering under repeated chords. Some of the pedal notes refused to work (possibly because Aunt Lou Miller never used those nearer the top of the pedal board). Eventually the trustees were persuaded to get the action sorted out. Unfortunately they used someone who did not know much about the unusual type of pneumatic action used by Coates. This made things worse, so that the organ became virtually unplayable. In the early 1990s I persuaded the Kent firm of F H Browne and Sons, which had just rebuilt my Harrison organ in St Leonard’s Hythe, to put things right. Their conclusion was that it would be cheaper to remove the damaged pneumatic action and replace it with modern electro-pneumatic action, which they did. This also allowed the installation of some thumb pistons which were adjustable. I think a Swell Octave coupler was added as well. Also the non-standard pedal board was replaced with a standard size one they happened to have in stock. I think that the blower was also replaced – the original was very noisy. Frances (Miss Frances Hill) paid for the rebuild – I seem to remember it cost £14,000 – but mother may have made a token contribution too. On organists, Aunt Lou (Mrs WG Miller, the former Miss Louisa Hill born 1881) had originally played the American organ but was sent on some lessons to learn how to play the pipe organ. I do not remember her using the horn stop very much at all. In fact, when I sang in the choir as a boy (up to 1958, when aged 14 I became organist at Sanford St Congregational Church) I recall that she hardly ever changed stops. Pedal notes were very occasional special effects. And she left out thirds in chords if they were inconvenient, which made hymn playovers a pain at times. There was the classic situation when, at a Sunday School Anniversary services, she accused Howard Hill, who was conducting, of not having been in his place that morning. The truth was that he had been, but she had not looked once! So much for following a beat.